How many times have you felt anxious at the thought of attending a visitation? Did you run through what you might say to those in the receiving line? If so, you aren’t alone. People often feel uncomfortable and unsure of what to say or do. The following video by Kay Warren provides helpful guidance in what and what not to say. If you aren’t a person of prayer, you can simply say “I’m keeping you in my thoughts”. Remember, your presence can speak volumes. Sitting silently with a family member or friend or offering a hug, can have tremendous therapeutic benefits. Often, we look to find an answer as to why a person died and offer that insight to the family. That approach is not helpful. We’ve cared for families, who have also had people pass judgement around the death of their loved one. As my mother always says, “If you can’t say something nice (or helpful), don’t say anything at all”. Children who have lost a loved one want one thing – the truth. It is important to share factual, age-appropriate information with children about death. As adults, we set an example for the children in our lives. It is okay to tell them that we don’t have all the answers. It is okay for us to show emotion or find some other healthy outlet for our grief. 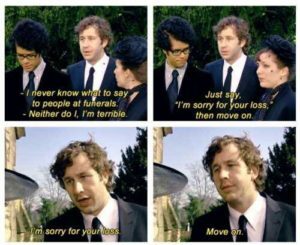 It is important to remember that grief doesn’t end after the funeral, after a year or even after years. There are special times (death anniversaries, birthdays, holidays etc.) that will trigger feelings of grief. Be sure to acknowledge the person’s feelings and offer your presence. As funeral service professionals, we are here to provide continued support to the families we have been honoured to care for – weeks, months and years after a death.